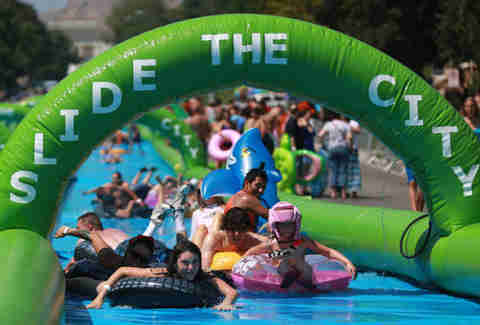 A company called Slide the City plans to unfurl a massive Slip 'N Slide in the middle of Manhattan sometime this August. What could possibly go wrong? For $20, you'll be able to fly down a 1,000ft Slip 'N Slide atop an inflatable tube — and not the impromptu, let's-hurl-ourselves-headfirst-down-the-gross-flooded-wet-street type of Slip 'N Slide like this one in Times Square during Hurricane Irene in 2011. 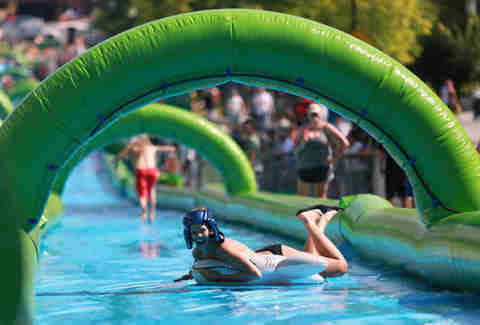 Along with a Slip 'N Slide somewhere in the "heart of Manhattan," Slide the City Marketing Director Dustin Butcher told Thrillist the company is looking to bring the event to multiple locations in NYC boroughs, but details on exactly where and when won't be available for a few more weeks. 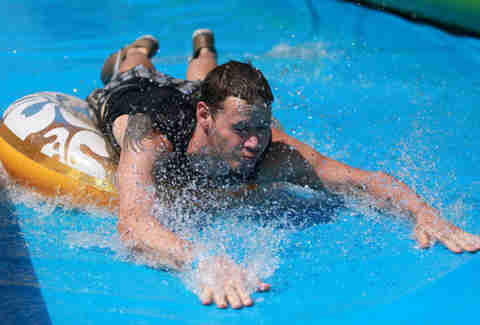 NYC is just one of several additional cities to get a Slip 'N Slide this summer, including San Francisco. 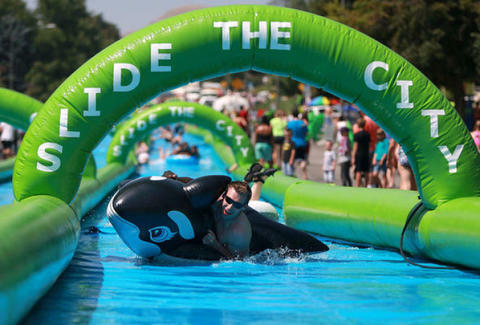 The giant Slip 'N Slides have already been a success in places like Salt Lake City and Boise, Idaho, Butcher said. And if you can make it in Boise, Idaho, you can make it anywhere. Registration hasn't opened for NYC, but you can expect to pay $20 for a single ride wristband, or $15 if you register early. $60 will get you unlimited slippin' and slidin' for an entire day. All wristband packages include a mouthguard (yours to keep! not a rental!) and a water-gun (problematic?). Those with single slide wristbands will have to either bring their own inflatable tube or purchase one at the event. So you'll finally have reason to dust off the inflatable tube device you have packed in the back of your storage shed. See more photos below of Salt Lake City-ans on the Slip 'N Slide, frolicking and merrymaking and definitely having more fun than they're allowed to have in Utah. Tony Merevick is Cities News Editor at Thrillist and welcomes any and all ways to combat the heat of NYC in the summer, which is still better than a potentially nasty winter storm. Follow him on Twitter @tonymerevick.